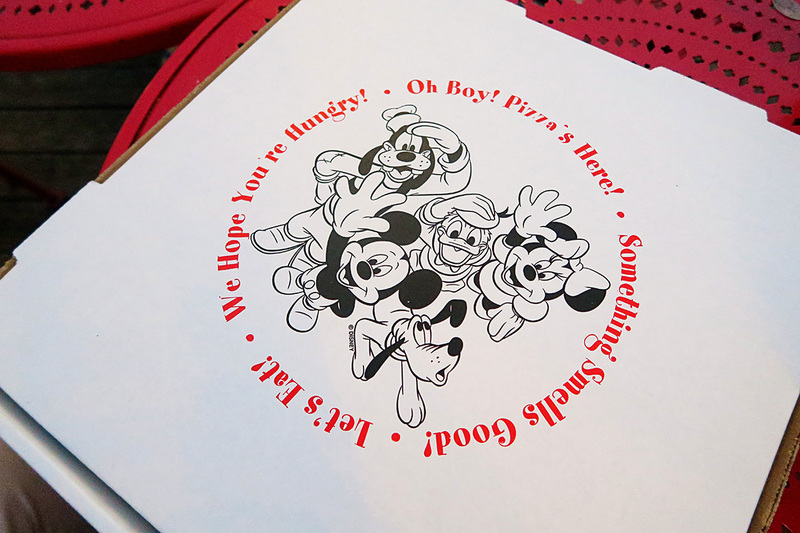 I like to think myself as a bit of a Disney World restaurant connoisseur nowadays. Now obviously I haven’t been to every single restaurant in Disney World because there are so many. But the one thing I am is a planner and before each of our Disney World visits I have spent a great deal of time planning and trying to get reservations. That’s the thing, the most popular Disney restaurants do book up months in advance. I would spend hours researching which were the best restaurants to go to and then I would check every single day on the ‘My Disney Experience’ app to see if the restaurants I couldn’t initially get had reservations. (Definitely download that app if you haven’t already got it- it’s an absolute must for planning your Disney trip). Therefore I thought I would share a post with our Top 10 Disney World restaurants that we love and think that you just have to try. I am not planning on doing these in any sort of order of preference but the number 1 spot and actually our number 1 restaurant in Disney World absolutely has to be Chef Mickey’s. Based in the Contemporary Resort, it truly is the full magical Disney experience. 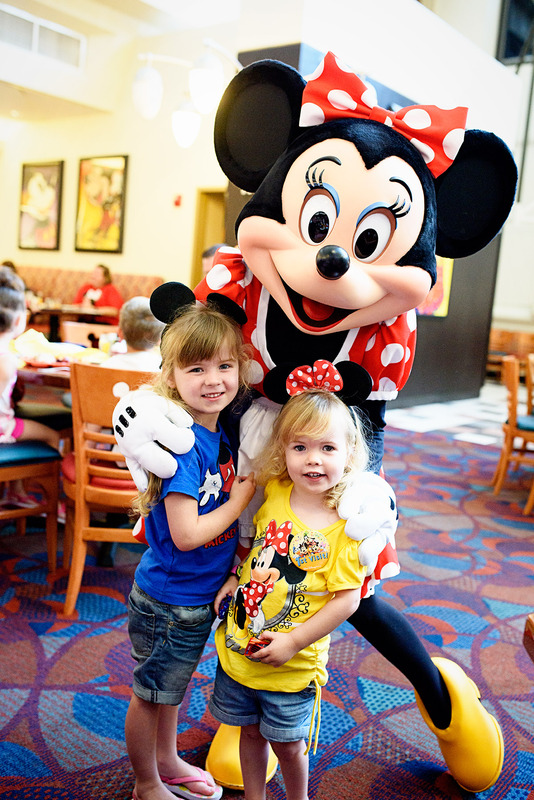 Chef Mickey’s is a buffet restaurant and offers breakfast and evening meals with an added extra- it is a character dining experience. 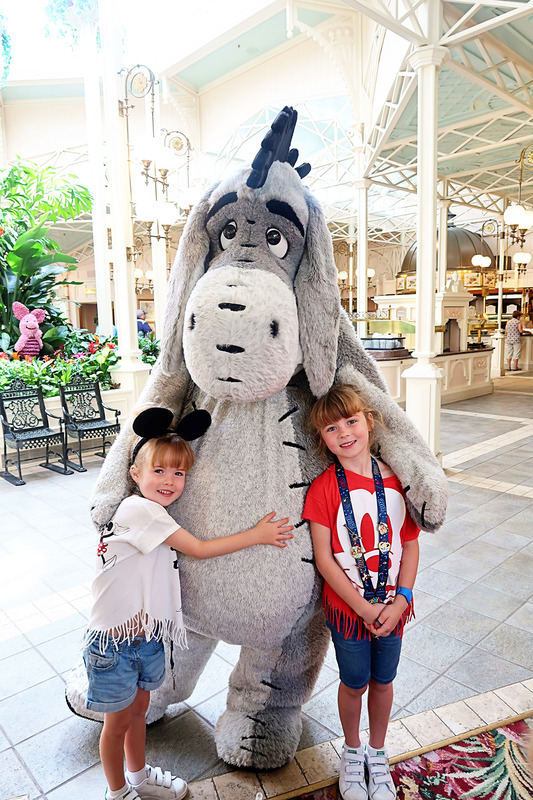 This means that some of your favourite Disney friends come round and visit you at your table, they will pose for photos with you and sign autographs too. 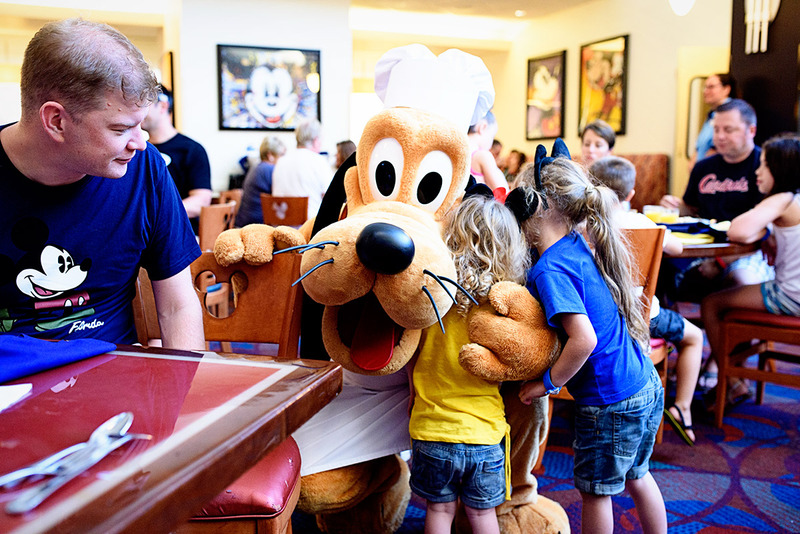 The characters at Chef Mickey’s are Mickey, Minnie, Donald, Goofy and Pluto and doing a character dining experience is a great way of getting up close and personal with the characters without having to wait in line. If your budget allows it I would say you have to at least do one character meal during your time at Disney. 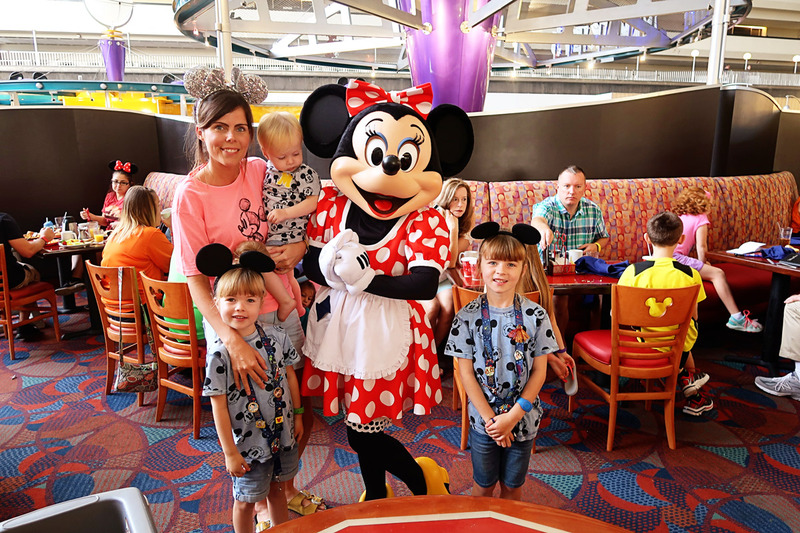 In terms of the food, we have only been at breakfast time, but breakfast is our favourite meal to have at Disney World and you won’t be disappointed. 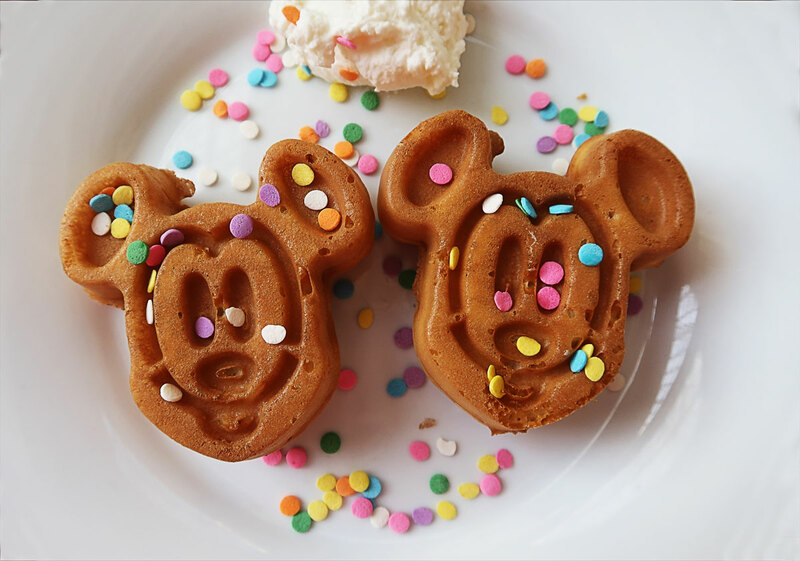 Think cooked options, lots of delicious sweet pancakes and pastries and the legendary Mickey Waffles (which you can have with sprinkles and cream- I am not sure if it counts as more of a dessert than breakfast but if you can’t eat it when you are on holiday when can you?!). It’s a little on the pricey side but I can promise you you will not be disappointed. Try and book it as early in advance as possible because it books up very quickly. 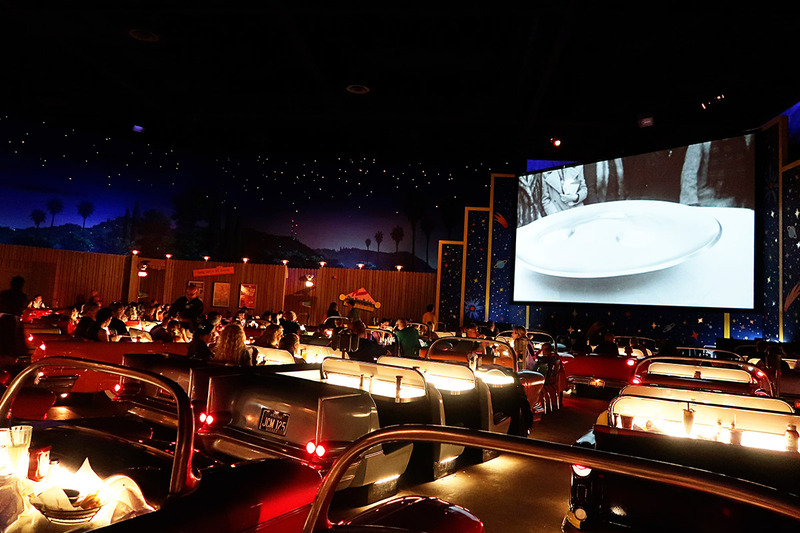 The first time we went to Disney World, we didn’t know about the Sci- Fi Dine-In Theater Restaurant, located at Hollywood Studios, but now I wish we had. It’s probably the most crazy looking restaurant we have ever been too and it is so much fun for all the family. Featuring delicious American style cuisine (think burgers, hot dogs and fries), it actually isn’t the food you’ll be amazed at- it’s the setting. 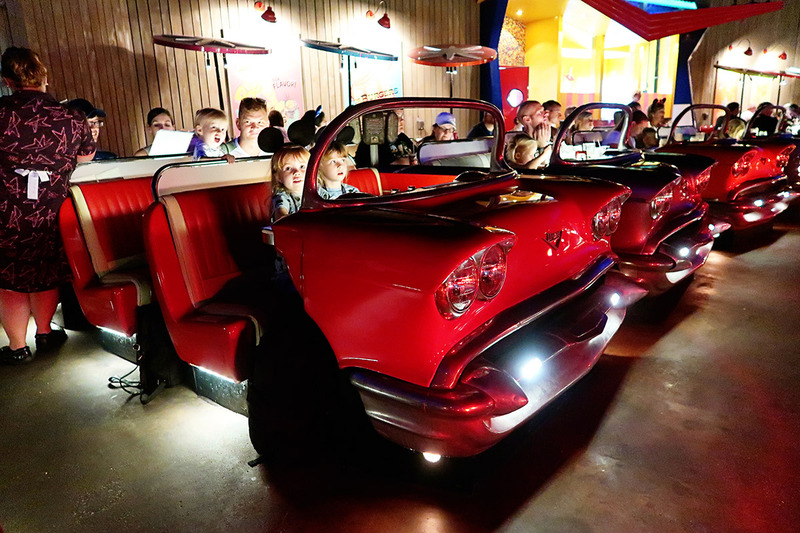 Set in the dark in a huge building with stars on the ceiling, you eat your meal in a car shaped booth (complete with working headlights) while watching a massive cinema screen showing old movies and programmes from the past. 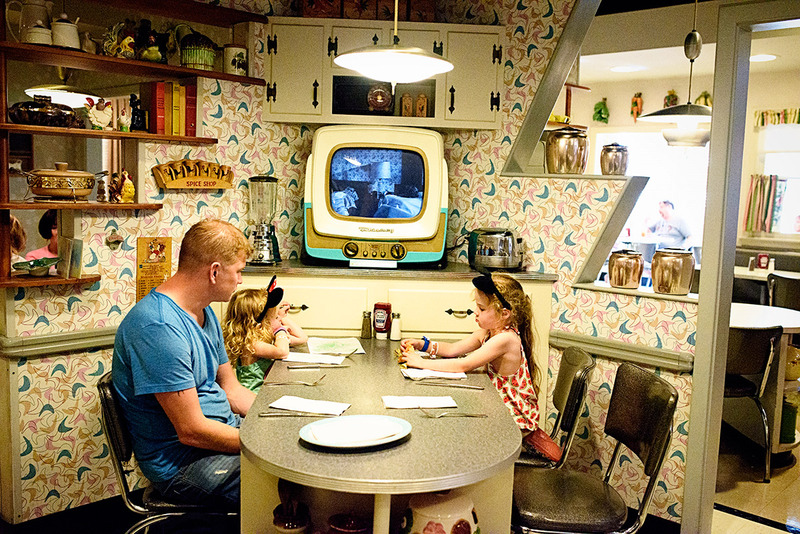 My little girls absolutely love sitting in front of us while we sit behind, and it really is such a great experience. Again this one always seems to book up really far in advance (you can make restaurant reservations up to 180 days in advance) so be sure to book a reservation as quick as you can. Based in Magic Kingdom, The Crystal Palace is another character dining experience but this time there is no Mickey Mouse in sight. Instead it’s Winnie the Pooh and friends who will come to your table and take photos with you, sign autograph books and generally have some fun. The Crystal Palace building is lovely and inspired by Victorian greenhouses of the 1800’s and indeed the servers are dressed in such a way too. It’s another buffet restaurant and we have only ever been for lunch, and I must admit that the food isn’t amazing for the price. (As it is a character dining experience it is one of Disney’s $$-$$$ price ranges) It’s a bit of a mish mash of food, with things like hot cooked meats, veg, mash potato and a selection of cooked salads, but in all honesty you don’t come for the food. It’s not like the food isn’t good, it’s still tasty, and the main thing you come for is to meet Winnie, Piglet, Tigger and Eeyore. 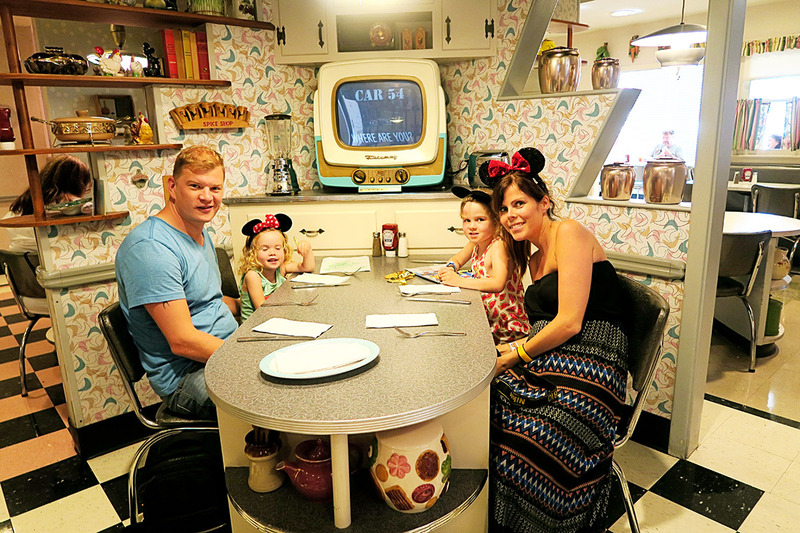 It’s great fun and in my opinion one of the unmissable restaurants at Disney World. We also think it’s a great way of having a good rest and getting time to recharge your batteries. While Magic Kingdom is always going to be my favourite park, it is also a very full on day especially if you are only there for one day, so having a sit down meal is a great way of having a bit of a rest. 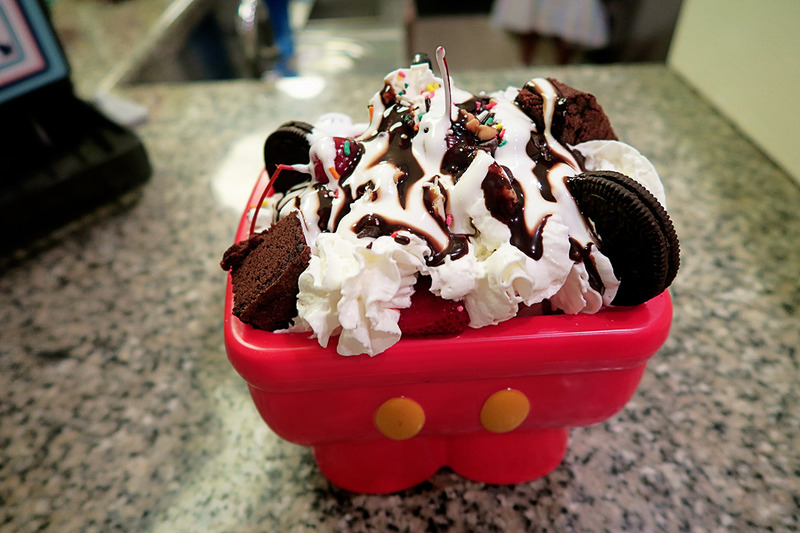 I first heard about Beaches & Cream from a lady who follows me on instagram and she told me that we absolutely had to go to get a ‘Mickey Sink’. We were a little clueless in the beginning as to what a Mickey Sink actually was but one quick google later and we were practically already in our hire car ready to go. The Mickey Sink is a bit of an infamous Disney World institution, a huge ice cream sundae in, you guessed it, a metal sink. You can also get smaller ones with plastic sinks that you can take home as souvenirs. They are big, you will probably want to share them, but they are an absolute must visit in our opinion. Beaches & Cream also does really good food, think burgers and classics like that, and is set in a sort of retro style diner with the servers all wearing pastel coloured 50’s style outfits. Based in Disney Springs, T-REX is a must have if you have young children. Our girls absolutely loved the noises, sounds and actions going on in the restaurant. Similar to the style of the Rainforest Cafe, T-REX is crazily themed with you guessed it, dinosaurs! Serving anything from salad to steaks, the main reason you come here is for the amazing atmosphere. There are dinosaurs wherever you look, a colour-changing ice cavern, a giant T-Rex, and you can spend ages wandering from room to room. It’s definitely worth a visit if you plan on visiting Disney Springs and because you don’t need a park ticket for Disney Springs it is a perfect way of enjoying a Disney restaurant. A new one to us, we first visited D’luxe Burger (based in Disney Springs) in October of this year and we are so glad we did. The burgers we had there were some of the best we had ever had, and that is definitely saying something. They have all sorts of different types of burgers, I had the El Diablo Burger with Chorizo and Signature Blend Beef, Fried Banana Peppers and onions and it was delicious. They also offer a range of tasty shakes, hand cut fries and a really unique range of dipping sauces. It is an absolute must have visit if you are a burger fan. One of my favourite memories from our recent trip was sitting watching the sun go down on the Disney Boardwalk eating pizza. The Boardwalk has to be on your list of places to visit as it is a really relaxed environment and a great way to spend an afternoon or evening. Grab either a slice of pizza or a whole pizza for the family to share and sit on the boardwalk and soak up the atmosphere. The pizza’s are also delicious which is a definite bonus. 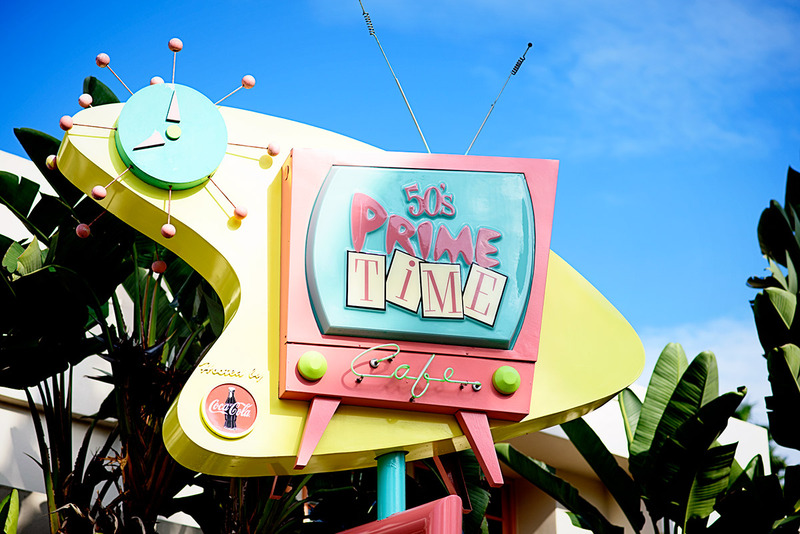 Based in Hollywood Studios, the 50’s Prime Time Cafe is a really unique dining experience. It’s all American food (think fried chicken and mashed potato) set in the most quirky old style diner, with tv’s on the table playing old black and white American tv shows. A sense of humour is a must as the servers are properly cheeky, telling you off for this and that and having some great fun. While we were there we got told to take our elbows off the table. It’s probably my favourite of the themed style restaurants, you won’t be able to take your eyes off the old fashioned vintage style decor. Almost everyone has heard of this pretty famous restaurant chain which has two locations at Disneyworld, including Disney Springs and the entrance to Animal Kingdom. We have eaten at both and both are great, the Disney Springs location has a volcano which spurts out fire and smoke every so often which the girls found really cool, while the Animal Kingdom location seems a bit quieter and a nice way to have a sit down for an hour in Animal Kingdom (you can also get to it without buying park tickets as it is right at the entrance). 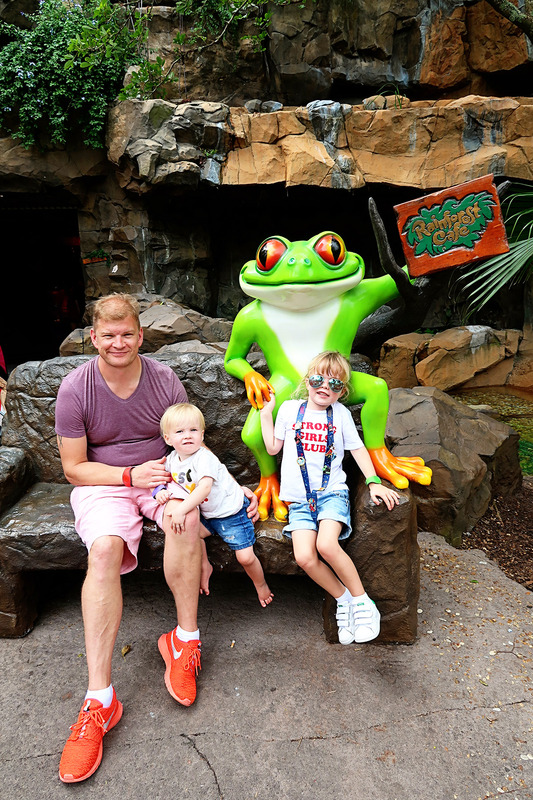 The Rainforest Cafe restaurants are highly themed, with animatronic animals wherever you look, waterfalls and dense lush greenery. It is definitely one to take the children too as mine found it fascinating. It has a vast menu, selling burgers, salads and other American favourites. Check out the bar stools with tails on them, our girls found these really funny. Not strictly a restaurant, but more a quick service window with seating outside, The Friar’s Nook in Magic Kingdom still makes my list as the Mac n Cheese is out of this world! We had seen this place mentioned on the @WDWToday twitter account which is a great account to follow for Disney inspiration (and support if you need it too), and we are so glad we headed for a meal here one evening in Magic Kingdom. The BBQ chicken Mac n Cheese is absolutely delicious and is making me hungry just thinking about it. If you are after a quick meal that doesn’t break the bank you can’t go far wrong at The Friar’s Nook. NB: Thanks to Visit Orlando and Disney for supporting our holiday to Orlando. All words, photos, videos and opinions are entirely my own and they haven’t asked me to write about anything- all content has been decided by me. You can follow them over on twitter, instagram and Facebook, plus download their amazing app to help you plan your trip here. I love planning our Disney restaurants. There are so many to try and find the time to eat in. We’ve been three times and only eaten in two on your list, having spent our meal times elsewhere. My favourite so far has to be Be Our Guest for dinner, the food is amazing. Wow! These restaurants look amazing. 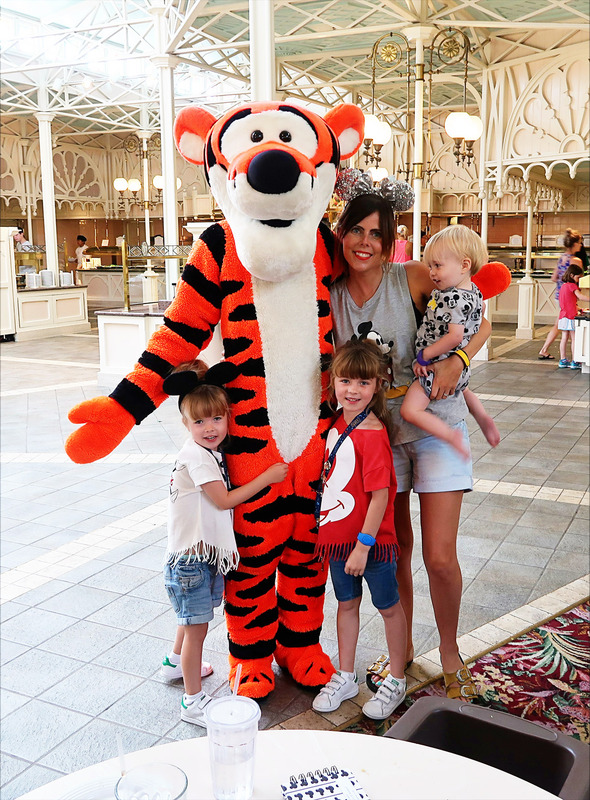 We have visited Euro Disney and although my 5 year old daughter loved meeting the characters we were not bowled over by the place. However if we ever look and diving into the All American Disney World I must admit for me the food is a big pull. These recommendations are great for anyone thinking of popping over. My eye would be on the 50’s prime time place.